Lightweight and strong till the end! Small, lightweight, compact size; sleek for covert ops; today's gear is low profile, subtle and packs a punch! Use the Hpa 13ci 3000psi Compressed Air Tank for the fastest action on the field. This tank barely weighs 1lb. and is perfect if you're looking to minimize space and maximize performance. This 13ci 3000psi hpa tank will fit in RAP4's flexi-air buttstock (3000psi tank version) and is also compatible with MilSig tactical markers air in the stock versions. Besides fitting inside buttstocks, the 13ci 3000psi compressed air tank is also great for any paintball marker you want a compact tank for. Built to last, this tank is made of aluminum and is one of the best tanks on the market. It can be filled with compressed air or Nitrogen gas. 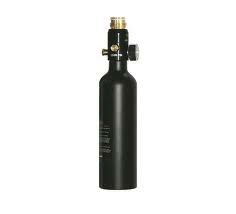 Buy the 13ci 3000psi Compressed Air Tank for a super low price at ChoicePaintballGuns. We not only sell tons of paintball guns, but offer deals on every related accessory as well; including many brands of high pressure air tanks.